Twine is a lightweight but powerful editor that you can use to write and produce branching scenarios. 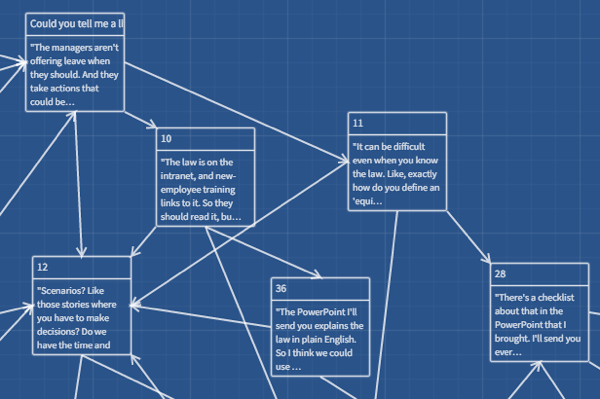 Here’s how Twine displays the flowchart a branching scenario. You double-click each “card” to edit that passage in the story. Each passage is essentially a multiple-choice question — it describes a situation and asks you to decide what to do. Each choice leads to a different passage that describes the consequence and then asks for another decision. See how Twine scenarios work by visiting my scenario examples page. Unlike many tools created for the elearning industry, Twine lets you extensively customize your materials, and it creates a standard HTML file. Twine’s output isn’t designed to work seamlessly in an LMS — if you need to track things, you might have some work to do, or consider embedding a Twine scenario in a “course” created using an industry tool like Storyline. You can use variables to track which scenes a player visits or how many decision points they went through, and it might be possible to pass those to an LMS, but I haven’t tried that. I’m not a big fan of tracking. For the version I recommend, you need to host any images yourself, meaning you need to FTP your images to a web server somewhere and then refer to them with HTML code in the story. You might have to learn some CSS, though these tips include code you can copy & paste without knowing much at all. The tool is open source, which means it might become an orphan. However, Twine has a relatively long history. A recent increase in use and new development will probably keep it up to date for some time. You can use an online version, or download Twine for Windows, Mac, and Linux. I recommend downloading it, because the downloaded version is more powerful, and the online version saves files in a potentially confusing way. Version 1 seems to be better at handling media, but I ran into several glitches with it on a Mac. Version 2 is what I recommend. It’s the most recent version and has a good amount of support available, plus it has worked great on my Mac. The tips on these pages apply to version 2. Recommendation: Download the most recent version (2.-something) here. The developer of Twine, Chris Klimas, has a Patreon page where you can contribute to help him continue development. Twine is free. Similar tools from elearning vendors can cost more than $1,000. Please consider giving Chris some portion of the money that you won’t be spending on those other tools. Chris is also available to help you develop interactive stories. See his site at Unmapped Path. Here are some places where you can learn more tricks with Twine. YouTube users who have published Twine videos and tutorials include Dan Cox, MrOommen1, and VegetarianZombie. I can’t provide support for Twine or help you decide which tool is best for you. Please see the above links for help with Twine, and to discuss tools, you might try one of the many LinkedIn discussion groups for elearning.